Why checking the burner flame in water heaters is important? What should you do if the flame is yellow, orange or blue color? What are the most common problems if the gas is not burning properly and how to avoid it? Every gas-powered and tank-type water heater uses the gas burner located in the combustion chamber to heat water, pilot light or electrode to light the fire, and gas control valve to deliver natural or propane gas. During the burning process, exhaust gases are vented out, either naturally or forced. In order to check the condition of the gas burner and a flame, there is an opening at the bottom of the unit or provided viewport. Most of today's gas water heaters are equipped with the FVIR or Flammable Vapor Ignition Resistant technology and special flame-arrestor, which prevents the flame and burning vapors to escape the combustion chamber, exposing you and your family to open fire and potentially - explosion. Those water heaters that are subjected to this problem will show discoloration on the flame arrestor, which will require the unit replacement. Some gas water heaters are equipped with the air shutter, which allows you to adjust the air-gas mixture for proper burning. Too much of air will cause the burner flame to lift off the burner ports and burn with the noise. On the other side, not enough air will cause sooting. The manually adjustable air shutter is usually found on the cast iron burners, while the steel burners utilize the self-adjusting air mixture. 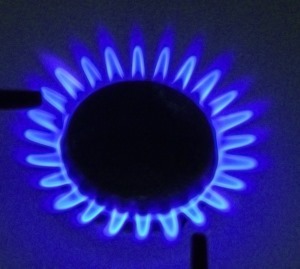 The main indicators of the proper gas combustion are the stable blue flame or blue flame with the yellow inner cones (see the picture). It is also OK to see the tip of the flame with a slightly yellow color. Proper operation requires sufficient air supply and ventilation, and the venting and exhaust system must not be blocked or have any obstructions. Fresh air is usually delivered through the provisions on the wall (atmospheric type water heater), which must be made per codes and manufacturer's instructions. A correctly formed water heater burner flame also depends on the proper draft in the draft hood, so regular check-up is recommended. One of the easiest ways is to use the flame of a match, candle or smoke, and if the steady flame is drawn into the opening a proper draft is established. Remove the scale from the top of the gas burner. The problem might be an insufficient air, and the fix is to provide proper ventilation to the water heater. If the flue or vent system is blocked make sure to find the cause, clean the pipes and remove the blockage. Proper supply of combustion air is mandatory, especially if the water heater is installed in the closed or confined area. If the main burner or burner orifice is clogged, make sure to unclog them or replace the orifice. If the excessive heat build-up inside the chamber, the thermal switch will trip, shutting down the whole water heater. Yellow burner flame is the number-one reason for the excessive smoking and sooting of the combustion chamber, flue tubes, and gas burner. This is what affects the normal operation of the water heater, damages the unit and your health. The orifice on the main burner might be too big. Replace it. If the venting system is blocked, clean it and make sure that air and flue passageways are free of deposits and debris. If the problem is with the high gas pressure, call the utility company. If the problem is with the cold or excess draft, find the cause and fix the problem. If the water heater is getting too much air, this requires the proper adjustment on the air shutter, to reduce the air supply. Is the flue properly connected to the water heater? Reconnect if necessary. Reduce the air supply on the air shutter as the water heater is getting too much air. Check with the utility company as the heater might be having high gas pressure. Correct the problem related to the excess draft. High gas pressure... check with the utility company. Loose or no connection between the water heater and the flue. If there is reduced air supply, increase the amount of air. Keep in mind that the adequate supply of combustion and ventilating air must be provided without any obstructions. If there is an insufficient supply of air, the products of combustion will re-circulate, which will contaminate the surrounding air causing possible health risks. As seen from the above, one of the first signals of the improper gas combustion is the change in flame pattern, its color, shape, and height. Visual check of the main burner, burner flame, and pilot light should be done regularly, at least once in six months, followed by dust and debris cleaning of the burner and combustion chamber.